In the past few months, crypto traders have been so much disappointed by the declining prices of the majority of the crypto coins. This includes BitShares (BTS) whose price dropped from $0.87 USD to around $0.12 USD. This represents 86% drop in prices. If a trader or an investor held BitShares (BTS) coins from January 4th to the beginning of April this year, he or she would have made total loss if they decided to sell the coins during that period. BTS was one of the coins that was worst affected by the miss harps that were happening in the crypto market during the Q1, 2018. But as from the beginning of April, BitShares token has started to appreciate once more. As its price rises the target is at $1 USD by the end of Q2, 2018. For the month of April alone the crypto coin has appreciated by 198%, which is a major move in such a short period of time. If this momentum is maintained, then it would take a bout 4 months for the value of the coin to get to $1. What caused the sudden improvement? Traders must be wondering what caused the crypto coin to make the about turn from a bearish trend to a bullish trend. 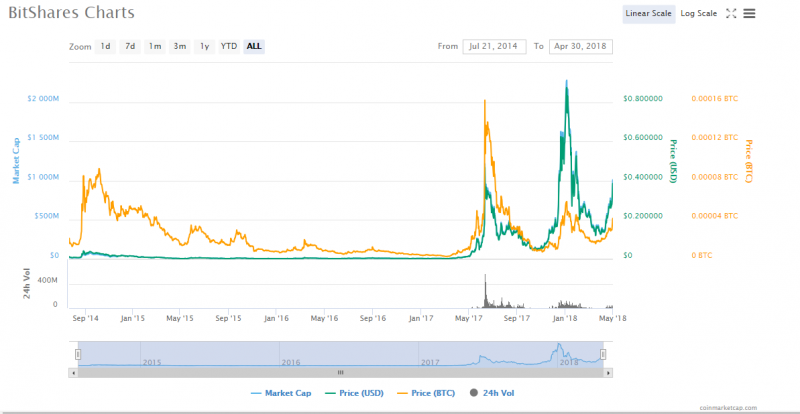 If we take a short history about BitShares (BTS), we shall ralize that the value of its token stayed below $0.01 USD for more than 2 consequtive years. It is only after April 2017 when its value started rising slowly. Then the bullish trend caught momentum in May and lasted till the beginning of June the same year. After that, the price droped once again but managed to stay above $0.05 USD till mid October the same year after which the prices started to rise again. The climax was in aerly January 2018, when the prices went past $0.8 USD before droping sharply again for the rest of the year to slightly below $0.15 USD. All along the journey the development team has been working hard to make a difference. For instance, the team came up with the State of the Network (BSotN) address where they discuss how the BitShares network has been faring on a weekly basis. The State of the Network (BSotN) report has helped to improve the network thus attracting more investors. Is it a good time to purchase BitShares (BTS)? This is the perfect time to purchase BTS tokens before it becomes unaffordable. At the current price, you can by more tokens and sell them after like a month at a higher price so as to make profit.